Brownietastic. Don’t worry if it looks bobbly, it still tastes great. I don’t cook many puddings, mainly because of the risk that I will scoff the lot. This means that when I do, I like them to be good ones. This particular chocolate brownie recipe is a real winner because it uses cheap and cheerful ingredients with no nuts, so gets devoured by all generations, including any nut-hating children. I’ve tried the recipe loads of times, both with brand name ingredients and value range substitutes, and it still tastes great. I can heartily recommend serving it warm with ice cream, to really appreciate the melting chocolate deliciousness. The mystery ingredient came about when I was feeling smug about buying a bargain Terry’s dark chocolate orange for my sister well ahead of Christmas, and stashed it out of reach on top of our tall fridge freezer. 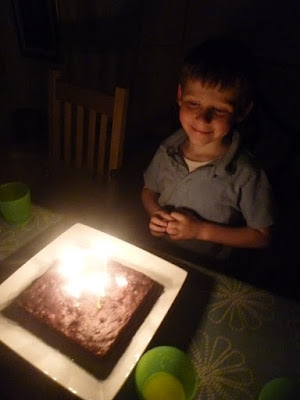 Then one morning I came down to find a chair pushed up against the fridge, a trail of cardboard box, plastic packaging and foil leading to the TV, and my five-year-old ensconced on the sofa with a guilty expression smeared in chocolate. Turns out my sister is not the only chocolate orange fan in the family. I removed the remains, but could hardly wrap up a half-eaten chocolate orange as a Christmas present. Instead, I decided to substitute chocolate orange for part of the dark chocolate in the brownie I was baking for friends due for lunch that day. The end result was fantastic. I thought the original chocolate brownie recipe was great, but the chocolate orange version was even better. So whether you stick to a standard version, or snap up a chocolate orange on offer in the run up to Christmas, do give this recipe a whirl. 200g dark chocolate. Substitute half for chocolate orange if you really want to push the boat out. 60p for 2 x 100g Morrisons Savers Dark Chocolate, £2 for 1kg Stork, 55p for 1kg Silver Spoon Granulated Sugar, £2 for 15 mixed weight free range eggs, 45p for 1.5kg Morrisons Savers Plain Flour, £2 for 250g Morrisons Cocoa Powder, 60p for 2 x 100g Morrisons Savers Milk Chocolate. Pre-heat your oven to 200 degrees C / 180 degrees C if you have a fan oven / gas mark 6. Line a baking tin or ceramic dish with greaseproof paper. Make sure there’s enough sticking up at the sides so you can use it to haul the brownie out once it’s cooked. Bung the Stork in a small saucepan, and put broken up pieces of dark chocolate or chocolate orange on top. Then heat it over a LOW heat, stirring occasionally until the chocolate and Stork have all melted together. Take the pan off the heat and let it cool slightly, so you don’t end up with scrambled eggs. Meanwhile, break the eggs into a clean mixing bowl, add the sugar, and whisk the mixture until it’s creamy. Add the chocolate mixture, and combine carefully. Sieve the flour and cocoa on top, and fold in using a metal spoon rather than bashing all the air out with a wooden spoon. Then add the chopped up milk chocolate, pour it all into the tin or dish, and bake for about 35 to 40 minutes. Once you’ve taken it out, let it cool a little before lifting it out using the greasproof paper. Peel the paper off, cut into chunks depending on appetite and enthusiasm, and serve. If you’re trying to make it look smarter, slice off the edges before taking it to the table. Then go and find a better hiding place for any other chocolate you’ve bought for Christmas. I'm more of a custard fan that ice cream but OMG does this sound delicious! Especially with half a chocolate orange!